Even on the fast-revolving carousel of Greek finance ministers, we haven’t come across this problem for a while. Yanis Varoufakis’s name seemed to be anglicised (or, to be more precise, romanised) the same way the whole world over, from the Wall Street Journal to Paris-Match, and the brief tenure of the now-departing Euclid Tsakalotos didn’t seem to cause any major problems. But five minutes of puzzled Googling for a short news story has thrown up any number of transliterations for the new man, Manchester-based academic Γιώργος Χουλιαράκης. The ECB says approvingly that “he knows what he’s doing”. Let’s hope, during his brief tenure until the Greek elections, that we look like we do too. House style is always important to a certain extent – consistency of spelling and word choice all add subliminally to the authority and tone of a publication’s work. But transliterated proper nouns is where it really matters (and, simultaneously, where it’s hardest to be consistent). English-speakers not familiar with Greek nomenclature might well assume that Yorgos Houliarakis and George Chouliarakis are two different people with similar names in Athens, just as many might still be unclear that Deir ez-Zour and Deyr Azzour* – another notorious pitfall for transcription – are one and the same place in Syria. God bless Google – it finds all the variations whatever you search for. But that does mean that you can be deceived by confirmation bias when you hurriedly paste the reporter’s spelling into the search box and see it come up with hits. It’s a hard problem to solve. You can set some general rules for transliteration, as the Tribune’s style guide does in a 600-word entry on Arabic names, but even that starts off by admitting “there are dozens of ways of writing the former Libyan leader Muammar Gaddafi’s name in English, and a reasonable argument can be made for adopting almost any of them”. The only real solution is to pick a style, notify everyone and keep a long and growing list of romanisations available for the copy desk to refer to. It’s a fiddly, awkward, case-by-case approach that can’t be replaced by rules or “common sense”, but it’s worth it: because otherwise you can cause an awful lot of confusion without ever being wrong. Today, I have to tell you, working as a print-only copy editor is not a job with a future. A tremendous amount of content goes online, and it must be produced, formatted, and, yes, edited. If you can’t or won’t master these skills, the paper will find someone who will. This situation is exactly parallel to the introduction of editing for print on computers thirty years ago. He’s right. There is concern in some places that the function of the website – hitherto, perhaps, an adjunct to an established newspaper – is starting to encroach on the production of the main event: printed pages. That’s certainly what’s happened here at the Tribune. Where once the uploaders meekly fished into a pool of print stories and put a few of them on a website as an experiment, now the whole day is arranged for the production of rolling live news online, and the print newsdesk is the one unobtrusively harvesting stories for the paper that have already been published for hours. That sounds depressing: but it isn’t. In fact, it’s good news. The success of internet news is far from the worst thing that could have happened to copy editors. Twelve years ago, before it was clear that newspaper websites were going to work, news publishers’ proposals for survival revolved around taking costs out of the print operation. There was a distinct prospect – which has become a grim reality in many places – of print subs being bypassed altogether for a model in which reporters typed straight onto pages drawn up by designers, and either wrote their own headlines or wrote headlines for each other. Redundancy has beckoned for thousands of subs, particularly in the US and the British local press. Now, the economics of newspapering are far from being solved, and the gaps in some balance sheets are as bad as they ever were. But the spectacular audience success of news websites has presented some copy-desk managers with an even more pressing problem: suddenly, there’s just so much work to do. Why? On a typical print paper, a designer takes care of the pictures, worries about where the adverts sit in relation to the editorial, and talks to the graphics desk, while the sub just takes care of the text. The visual work and the textual work are divided. But on the web, there is no designer for the article – or, to look at it another way, the webpage – that you are working on. Yes, the basic web layout will be a template: but you, the copy sub, are now the one flicking through the photo library, navigating round the downpage pop-up ads and wrestling with the embed codes for the bar chart, before you ever get to the headline and the text. On the web, you are the editor, the picture editor and the designer. This transfer of emphasis from print to web has had another consequence too. When the paper was the flagship, all the management attention and agonising – over photoshoots, headlines, word counts, look and feel – was directed to the print pages. This was the period when the web was seen as being cheap and easy, quick and dirty – a headline, some text and maybe a pic semi-automatically ported into cyberspace. But now, as the website itself becomes the calling card of a news organisation, that attention is getting focused online. We have started to see the emergence of elaborate internet-only showpieces like the New York Times’s “Snowfall” or the Guardian’s “Carbon Bombs” – productions as intricate and labour-intensive as the most impressive double-page graphic. The management at the Tribune has now explicitly asked for more production time to be taken over web stories, to furnish them with extra pictures and other display items. What does that mean? As an experiment, below is a representative sample of articles, ranked in length order, from my last two news shifts on the Sunday edition of the paper. I timed how long it took me to edit them for print, then stopped the clock and restarted it to find out how much extra time was needed to prepare the same article for the web. The old production system at the Tribune, which we still use for the Sunday edition, is ideally suited for this experiment, because it’s an integrated print-and-web system that prepares articles for both formats. (Production on the daily edition, by contrast, has now split onto two entirely separate platforms.) Working on a Sunday article naturally breaks itself into a two-stage, print-then-web process. You edit, cut the copy and write the furniture just as you would for a print-only paper, with the only proviso that any copy sacrificed for fit but otherwise decent is put into ‘web-only’ mode, cutting it from the paper but not from the internet. Create a separate suite of web furniture (headline, standfirst, trail etc) based on your print furniture, rewritten as necessary to improve search-engine optimisation. Add a picture to the web article from the electronic photo library and write an Google-friendly caption. Find and embed further pictures in the body of the text (about one every 600 words or so) to break up long articles. Create a URL slug (the part of the web address that comes after the main site name, thus: http://www.thetribune.com/this-bit-is-the-slug), based on your headline. Add reference tags (usually seven or eight, selected from a large database) to the article so that it can be indexed by author, subject-matter and section on the website. Preview the webpage for appearance, and check your new furniture for widows and orphans (sometimes it takes two or three attempts to get it looking neat). Clear your search-engine optimisation efforts with the audience team, who will advise on what popular terms ought to be appearing in the headline. The lengths of time spent print subbing vary as much as you might expect: from an hour and a half for a 1,400-word double-page spread with all the trimmings down to less than 10 minutes for a single-stick news story with a one-column headline. But the time taken to web an article after subbing it varies much less: from half an hour for the big piece (most of it spent on picture research for the additional photos) down to 12 minute for the short story. There’s an irreducible minimum of work needed to get an article online, no matter how insignificant it is: you have to follow at least seven of the eight steps listed above every single time. 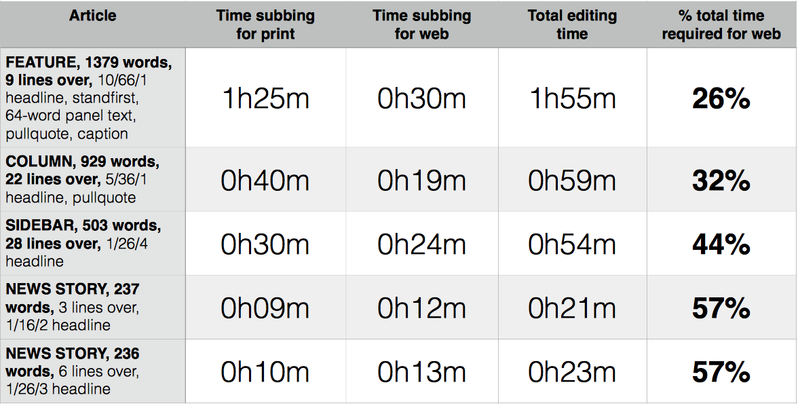 In fact, as the table shows, at below the 500-word mark, the time needed to web an article starts to exceed the time needed to edit it traditionally. In other words, short news stories now take more than twice as long to prepare as they used to. The editor-free, reporters-typing-onto-pages model, if it was ever going to work, might have worked in an impecunious non-digital era where to fill two text boxes was to finish the job. But that’s not how it is on the web. The web needs work: work that is too time-consuming and technical for a reporter to do. And that’s why copy desks that embrace the internet may actually be good news: because in cyberspace there’s more work to do, not less. Singular “they” is a good thing. It helps you avoid the clunkiness of “he or she”/”his or her”/”himself or herself” all through an article where gender is irrelevant. It is sometimes the preferred non-specific pronoun when referring to a trans person. And there’s one other thing it can do as well: it can help avoid a lawsuit. The Sunday Times’s high-profile revelation about doping in athletics comes with some alarming statistics, but no names – at least, not of the guilty. It has identified and exonerated some favourite British stars, to widespread national relief, but also found one “top UK athlete” whose blood-test results are said to be highly irregular. But because journalists agreed with the whistleblower who provided the data that they would not identify anyone on the suspicion list – and possibly also because the athlete in question, who emphatically denies the allegations, has threatened to sue – identities have been strictly concealed. Everything is withheld: the name, the events, the sport, and, thanks to singular “they”, even the athlete’s gender. Last week the athlete said their score had been elevated because it had been taken when they were dehydrated after winning a race in summer temperatures. Thanks in part to singular “they”, the whole article largely avoids the danger of jigsaw identification. All that can be gleaned from it is that the person in question is a “top UK athlete” (whatever that means); that they were some kind of racer (which rules out the Olympic ball sports or field events like javelin and hammer); that they were active in the first decade of the 21st century; and that they are, perhaps, retired (with a hint of finality, the article refers to them having tested unusually highly “on three occasions during their career”). That’s all. In those circumstances, perhaps specifying gender wouldn’t have gone much further in directing suspicion. But incorporating all athletes of both sexes that fall within those very loose parameters leaves even the most eager speculator with little to go on.